Warren comes with a wealth of experience, and it shows. He graduated from UH Manoa with a BFA in photographic design. 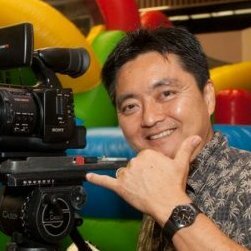 He interned with Universal Studios and Lorimar Productions, and later launched his career at KITV as a camera operator. Warren captures unique perspectives and has the technical expertise to always ensure a successful shoot. The final product? An intriguing piece of storytelling that stirs your soul, with each moment anticipated and captured in all of its beauty. A video or photograph beyond your wildest expectations that you, your family and friends will want to see time and time again. Whether you're doing a commercial, real estate, theatrical shoot, or special occasion such as a wedding, birthday, or anniversary, Warren will make sure it's an event to be remembered forever!